Are you still in love with your Nursing Career? OR did you love it at first and now feel overworked, fatigued and desiring something new? Have you ever thought about taking your passion out of the clinical setting and starting your own specialized nursing business? If so, this book is for you. 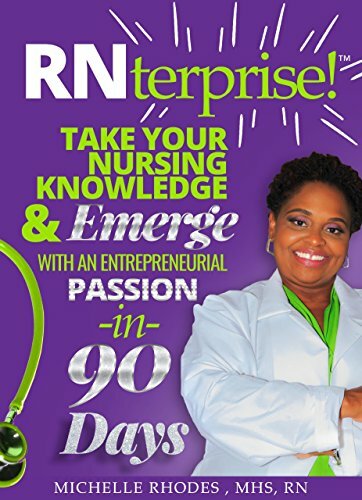 It is a step by step guide that provides you with all of the tools and advice you will need to move from your current nursing position and emerge as an empowered business owner in 90 days. Michelle Rhodes, "The RN Life Coach" will show you exactly how to envision the future you so desperately desire and the entrepreneurial actions needed to take in order to actually get there. Easy to read, with clear, actionable steps, this book will open your mind to the possibilities that exist to you as a nurse with in-demand skills, and it will light up the path to get you there. A great resource long after you have read it from start to finish; its a reference that you can turn back to again and again on your journey.